Enjoy a menorah lighting with soup, latkes, kids crafts, entertainment and more. Help buid a giant coin menorah. Join the 36th annual lighting of Tucson’s tallest Chanukah Menorah at El Presidio Park. Enjoy holiday treats, songs, and good times at this Tucson tradition. All welcome. Featuring the Great Chocolate Gelt Drop, latkes, donuts, music and more. Share the pleasure of knitting and crocheting. Help others with projects and patterns. Can’t knit? We’ll teach you. No reservations required. For more information, contact Harriet at 480.481.7033 or harrietc@vosjcc.org. Great food, speaker and new topics each month. 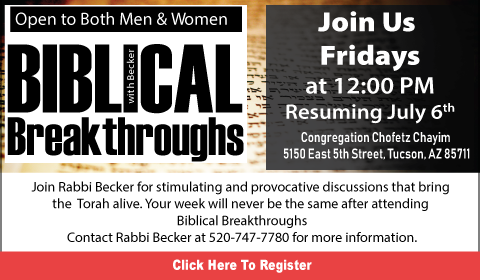 Enjoy a full kosher lunch and stay for the Discussion Group at 2pm. Suggested donation of $5. For information contact Chani at 602.492.7670 or chani@sosaz.org. Bill Adler leads stimulating discussion each month on current events. Bring your ideas to share with the group. Free. For more information, contact Harriet at 480.481.7033 or harrietc@vosjcc.org. Featuring donuts, latkes, music and gifts for children. 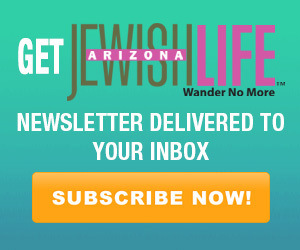 Featuring live ice menorah carving, ice skating, Israeli-style buffet lunch and crafts. Gather together with Rabbi Levi Levertov for a stimulating discussion on an issue relevant to Judaism in contemporary society. Bring your questions; he has answers! Free. For information contact Chani at 602.492.7670 or chani@sosaz.org. Explore the pivotal years in modern art when Picassso, Matisse, Stravinsky, Hemingway and Stein revolutionized the arts. Jeri Benoit shares this remarkable story. Members: $5; Guests: $8. Registration required at vosjcc.org/modern. An evening of BINGO-game fun, both old and new, with prizes galore. Includes dinner and movie too! Members: $10; Guests: $20. Grades Pre-K-4. Price per child until Dec. 10, $5 thereafter. Information and registration: vosjcc.org/knobingo. Learn knife skills with Italian cuisine expert Chef Tom Kressler. He will show you how to make several classic soups with your new knife skills as well. 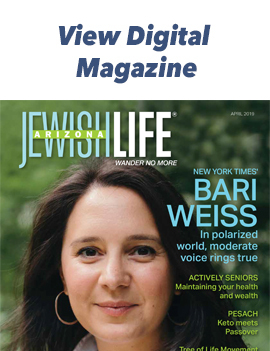 Supporting Jewish women in their journey through all stages of breast cancer ­– including treatment, recovery and the physical and spiritual challenges along the way. For more information, contact Jessica Knight at 202-359-6835 or jessicabcgroup@outlook.com. When school’s out, The J is the place to be with camp fun including art, drama, swimming (heated pool), games and more. Grades K-4. For pricing and details, please visit vosjcc.org/shemeshcamps.